After a great year, the Joystick-Cowboys from Flamebait Games returns with a new game called Verlet Swing. We had a little chat with them about the hard work, success and of course, the new title releasing soon! Tell us a little about the team, the joystick-cowboys! The cowboys have been doing weird games together for the last 4 years. But it wasn’t until two years ago when we started doing the indie thing for real with Passpartout. We just love experimenting with odd game mechanics and aesthetics. At Flamebait, we’re also very democratic in how we operate which means that everyone has a large impact on the game and its design. For instance, when deciding on what type of game idea to prototype each team member pitches an idea and we vote for which idea to prototype. We also don’t have a designated designer in the traditional sense, instead, everyone has to be involved in the design decisions which for us generates a ton of cool solutions. We’ve grown up playing a ton of video games, spent 3 years studying game development and are now spending most of our days either developing or playing games. It’s a huge part of our lives. At least for me, I’m living my teenage dream. As a Swedish game studio, how do you feel about the local indie scene? do you think it is getting the attention it deserves? Well, getting attention as an indie is harder than ever. However, I feel it’s super beneficial being a part of the Swedish indie scene because it has such a great track record. Your previous title Passpartout was seen everywhere when the biggest YouTubers picked it up. JacksepticEye, for example, had a lot of episodes featuring the game! How did that feel? We started out as five students who didn’t know what to expect from our first launch. Everyone we talked to iterate on the point that the first game as a studio never sells, that it never ‘makes it’. I believe JacksepticEye was one of the first big YouTubers who played the game and it was crazy. Truly unbelievable. We could barely get any sleep the week after that. It kind of felt like the day before Christmas when you were a kid. Except more unreal. What did the recognition do for you as a company and how was the feedback from the players? Well to say it rocket boosted our studio and our personal growth is an understatement. We had to go from students to the real deal within a short amount of time, which of course took a lot of effort. But all the great player feedback and seeing content creators making fantastic content about the game gave us a ton of energy to move forward. Of course, there were some people who flat out didn’t enjoy the game. That’s something that comes along with doing that type of weird niche gameplay I feel, it’s not going to be in everyone’s taste and that’s totally fine. 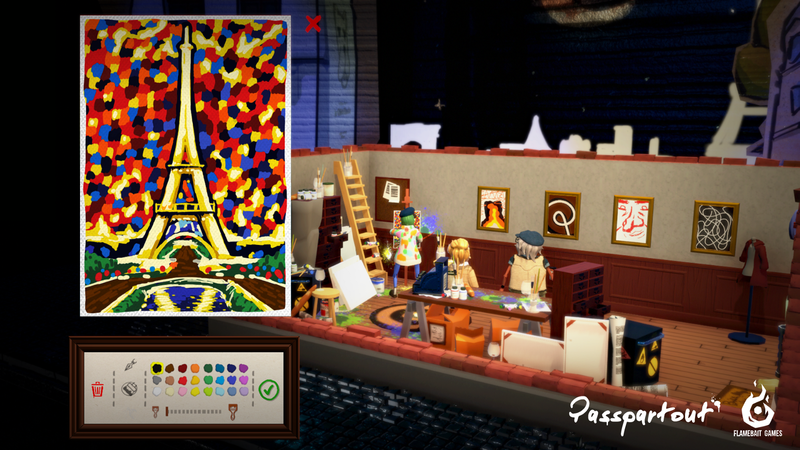 A lot of players were able to create their own art in the game. What’re some of your favorite creations? Oh wow, so many to pick from… The obvious choice would be one of the many paintings made by professional artists. For instance, one player made a fantastic Van Gogh. However, I personally enjoy the ones where you can see that people put in energy, effort, and heart into the paintings. How pretentious that might sound it makes me happy to think about the players who pour their heart and soul into their paintings, no matter their skill level. Tell us a bit about the new game Verlet Swing! 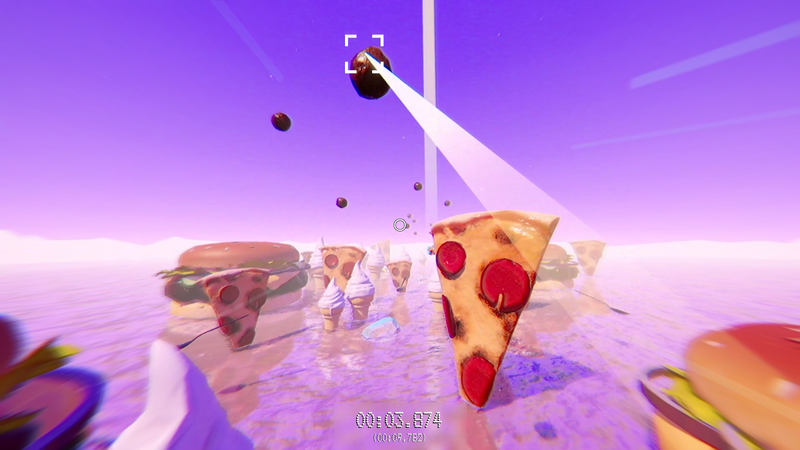 Verlet Swing is a first-person swinging game where you can hook onto almost anything. It’s fast, energetic and is coated in this weird vaporwave aesthetic. The game is designed to be easy to learn and hard to master. With 100 levels it gets increasingly difficult as we introduce exploding heads and flying meatballs. We’ve also added a level editor so you can create and share your cool stuff via Steamworks. Passpartout and Verlet Swing are two vastly different games. How did you end up in that direction? As a studio, we always try to test a ton of different ideas. After Passpartout we all felt that we wanted to do something different. I also believe we needed to do something different and that mainly has two reasons. Firstly, shipping a game is an exhausting process and especially creatively — we needed to do something different to get the creative mojo back. Secondly, we have previously struggled with creating “tight mechanics”, e.g. fast responsive juicy gameplay and we wanted to grow as a team by becoming better in that area. Verlet Swing has really helped us regain our creative mojo and become better at executing tight mechanics, which we’re super proud of. The trailer is pretty surreal and psychedelic, did any movies, games or other types of media inspire you when creating Verlet Swing? We wanted the focus of the game to be on its mechanics so we decided to go with a more abstract aesthetic. 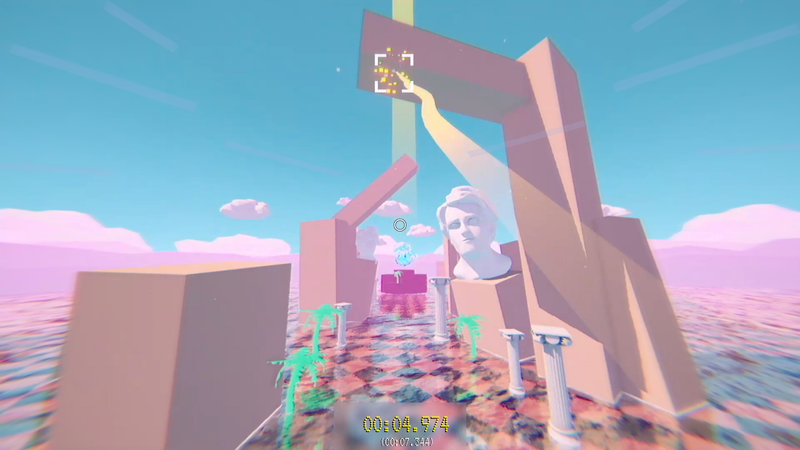 A vaporwave inspired approach gave us a lot of freedom to play around with an odd level design without being tethered to real-world expectations. It also allowed us to do something different from a more conventional game look which we feel makes the game stick out. Our main inspirations have been stuff like macintosh plus, seapunk, and simpsonwave. Describe Verlet Swing with three words! We saw that you have Japanese in the title, as well as a feeling that some levels are inspired by Asia. Is that true? Some levels are definitely inspired by the cyberpunk look that originated in large Asian cities like Tokyo, Shanghai and Hong Kong with dark streets lit up by neon lights. A good example of one of those levels is “Enter Damnation”. When is the game being released and where can they get a hold of it? Our in-game pizzas do not have pineapples nor bananas because we’re not barbarian heathens. We just wanted to take this opportunity make our stance clear within the politics of pizza. Please give us your links to your social media and homepage! Thanks a lot for doing this interview with us! We’re looking forward to Verlet Swing and future releases from Flamebait Games!